Is being vegetarian really cheaper? Is it better to cook for 1? Is there a good time of the day to shop? Feeding yourself at college can be tricky. If you’re not in a dormitory with a meal plan, you’re going to have to feed and fend for yourself. It can be even trickier if you’re used to mom and dad cooking for you for the last 18 years of your life. Because you may find your funds quite limited. 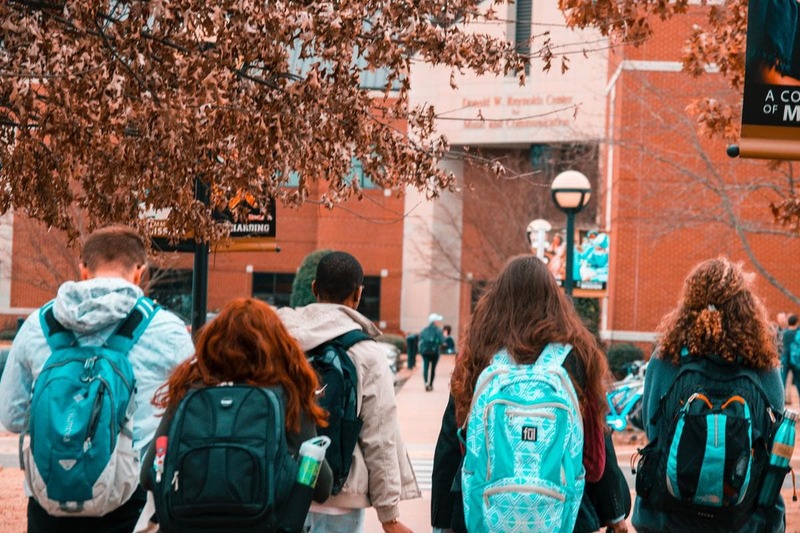 Yes, you’re gonna feel rich when that loan installment hits your bank account, but you’ll be surprised at just how much you’ll fritter away without realizing and how little you’ll have by the end of the semester. It’s best to be frugal from day one. But why also quick and filling? Well, college days are long and full of learning. You’re simply not going to have the time to rustle up a massive “piece de resistance” every breakfast, lunch, and dinner. But then, if you’re not eating right, you’re going to be finding yourself tired, distracted, and unmotivated. This won’t be at all conducive to getting any effective learning done. Lectures can be challenging enough for college students to stay awake in without being hungry and fatigued! So, let us take you through some questions you might have about building a brilliant grocery list for college students, then provide you with 10 great meal ideas to get you started. Afterwards, you’ll graduate with a free printable grocery list template. However, you can skip straight to the college shopping list if you wish. It’s very difficult to give a general figure. Your budget is very dependent on where you’re living and your dietary requirements. A student in studying in New York or London should be prepared to spend more on groceries than if studying in Bloomington or Sheffield. Likewise, if you’re gluten intolerant you might have to put aside more money for more expensive gluten-free products. Conversely, vegetarianism is generally cheaper than eating meat. The best thing to do is look at your college’s advice about how much you should budget for groceries. They’ll have the best information about what things cost locally. Then, adjust this to match your dietary requirements, and work from there. Meat is more expensive than fruit and vegetables. In recent years, meat prices have increased more than produce. However, that doesn’t mean vegetarianism is always cheaper. It all depends on how you shop. If you’re going to buy organic produce the price will go up. Likewise, you can bring the price of your shopping down by buying canned food, which is just as healthy as fresh but is mostly much cheaper. Vegetarian meals can be really good for being cheap, quick, and filling. By doing vegetarianism right, you can make sure you get plenty of fiber from grains to keep you full and focused, as well as even more fiber and protein from legumes. 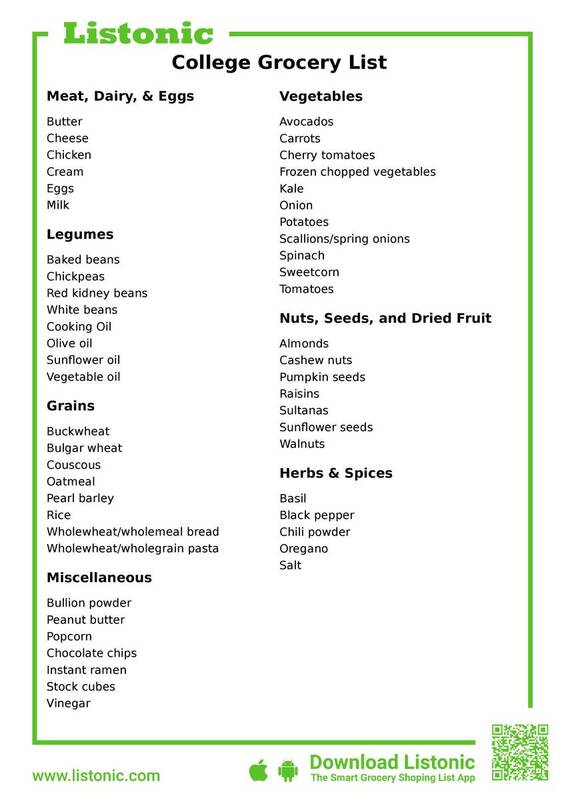 If you’re curious about switching to vegetarianism, you might want to take a look at our vegetarian shopping list. Eating vegetarian meals can certainly save you more than a few bucks. If you simply cannot live without meat, you should consider flexitarianism. The idea here is that you significantly reduce your meat consumption rather than eliminate it altogether. This could be kinder on your pocket without denying you your bacon fix. Cooking for one takes nearly as much time than cooking for 4 or more. So, in order to save you time, what you could do is follow a recipe for 4+ people, and then freeze or refrigerate the remaining portions. This means that, for the next few days, all you need to do is defrost and/or warm something up. So, make sure you have plenty of food containers to do this. But some meals are much better for freezing than others. For example, pasta dishes aren’t good for freezing as cooked pasta itself becomes very mushy once thawed out. When you first start shopping at a supermarket, you could try and notice what time items are being reduced. This generally tends to be towards the end of the day, so shopping then is a good bet. But just because something has been reduced doesn’t make it the cheapest option. Buying your usual item at full price might still cheaper than a reduced premium item. This is definitely the case when it turns out that the reduction is a matter of cents/pence rather than dollars/pounds. The bright red or yellow sticker just makes you “think” it’s a steal. Also, buying things randomly from the reduced section isn’t the best way to plan your meals. You might have to buy extra ingredients to prepare it. Worse still, it simply sits and goes bad in your fridge or gets forgotten about in your freezer. You can find some bargains on some basics, like bread, from time to time. But it’s still generally better to come up with a budgeted meal plan and grocery list and stick to it. Therefore, just going to the store when you’re able to rather than planning your trip around reductions will be a better use of your time. Now some questions have been answered, we’ll take you through 10 decent and delicious dishes that we feel should be staples on your grocery list. Doing any or all of the above will make your ramen not just tastier, but also a much better-balanced meal. There are plenty of other wild instant ramen recipes you can find online too. This has been a British student staple for decades. So, if something works, why change it? Baked beans are made with “haricot verts”. These are legumes. Legumes are high in fiber and protein, both of which will keep you full and healthy. They’re also quite cheap to buy. But that isn’t to say beans on toast can’t be improved. If you’re finding your beans a little bland, simply “jus” up the flavor by adding some herbs and spices. Also, you can also make it even more filling by using wholewheat/wholemeal bread which has more fiber than white bread. Oh, and the traditional sprinkling of grated cheese on top shouldn’t go amiss. It’s a simple yet filling and wholesome dish. All you need to do is cook some pasta, stir in some sauce, and “Bam!” You’ve got yourself a meal. But if you’re using tomato sauce from a jar, you’re doing it all wrong. You can make your own sauce for a fraction of the price. Your own homemade tomato sauce will also have less added sugar and sodium than the one you pick off the shelf. The above recipe will make about 2-4 servings depending on how hungry you are. You can make this meal even more filling by using wholegrain/wholewheat pasta which has more fiber than plain pasta. You can also add beans or diced chicken to give it a protein boost. Let start talking about breakfast for a bit. Oatmeal is your friend. It’s high in fiber, and also cheap. It can also be quick, easy, and very filling if you make it right. Instant oatmeal tends to be full of added sugar. It’s also pricey. But standard oatmeal takes time to make in the morning. Warming it up with milk or water in a pan or in the microwave is time-consuming. So, why not make your own overnight oats? Overnight oats simply means soaking the oatmeal overnight so that all the liquid has been absorbed making the oats edible. Many recipes for overnight oats involve adding milk, nuts, and dried fruit at their simplest. Just adding these ingredients will be enough to fill you with fiber and energy in the mornings. All you have to do in the morning is fetch your oats and eat them, making for an incredibly quick breakfast. It’s odd that ramen and beans on toast are considered student staples when sandwiches are a real savior. They’re cheap, quick to make, and can be quite filling if made right. Of course, you’re welcome to make any sandwich you desire: club, peanut butter and jelly, BLT. The list goes on. The best advice to make these as filling as possible is to use wholewheat/wholemeal bread to get that extra tummy-stuffing fiber. Buying some premade sandwich spread might push the cost up a little, but will certainly save you time when making them. Don’t underestimate soup. It may seem scary to make and not the heartiest of meals. But soup can be quite the opposite. The basis for any soup is “vegetables + liquid”. Usually, it involves frying some onions, adding the veg, and then boiling until soft in stock before blending. You can even add some cream to give it a bit more weight and flavor. It’s not difficult to find easy soup recipes online to start your soup-making adventure with. Choose vegetables that are high in fiber so a serving of soup keeps you nice and full. You might even consider adding a cup of grains such as rice, or even some legumes to boost the fiber and protein content. If you are still tentative about making your own, packet soup and canned soup are both good options. The latter requires a bit more time but is generally healthier and tasty than the further. But of course, there are exceptions. Salads get a bad rap for being boring and not very filling. But this is only the case if you don’t make them properly. Make sure you use plenty of legumes, nuts, seeds, or even some grains to give it a filling fiber and/or protein boost. You can even add some grilled chicken and avocado to up your salad’s protein game even further. However, the real trick is to get the dressing right. Many dressings, like popular ranch dressing, is usually full of saturated fat and added sugar. The real problem is the added sugar. This makes you crave snacks more, undoing the healthy meal you thought you just had. Therefore, consider making a cheap, easy, and zingy homemade dressing using only 2 ingredients: oil and vinegar. It’ll add flavor and tang without giving you a sugar rush. Couscous is incredibly easy to make. All you do is pour some hot water over it and, after a few minutes of soaking, it’s done. Couscous is also high in fiber, which means that you’ll feel nice and full afterwards. Not to mention, buying it plain is also usually quite cheap. But making a tasty, filling, and nourishing meal out of this does take a bit, but not much more, work. Firstly, avoid flavored couscous packs. They might be in handy portion sizes and already flavored, but they’re also expensive and contain lots of unnecessary ingredients. It’s really much better and cheaper to make your own. Probably the least exciting or surprising on our list, but that doesn’t mean it should be overlooked, especially as a snack. Popcorn, especially microwaveable popcorn, is easy and quick to make. It’s also generally quite low in calories. It’s a snack that’s not going to make you pile on the pounds. You can even add a little flavor to it by sprinkling some cocoa powder or chili powder over it. Nuts! Fruit! Seeds! And sometimes, chocolate chips! There’s a reason why trail mix is such a ubiquitous all-American snack: it’s because it’s great. Nuts, being legumes, are high in fiber and protein. Seeds are a great source of healthy monounsaturated fat and Omega-3. Dried fruit adds vitamins and sweetness. And chocolate chips are just delicious. As a snack, it triumphantly ticks all three of our student food criteria. You don’t even need to go out and buy a pricey pre-made mix. Make it yourself by buying the above ingredients, mix, and eat! Now that you’ve majored in these 10 great meal and snack ideas, we present to you our free printable grocery list for college students. Feel free to add your favorite snacks, or take off anything you don’t like in order to make this grocery list your own. What are the best ingredients you used for an epic trail mix? Is couscous easy and cheap to find where you live? What oil and vinegar combination do you use for your favorite salad dressing? Let us know in the comments.